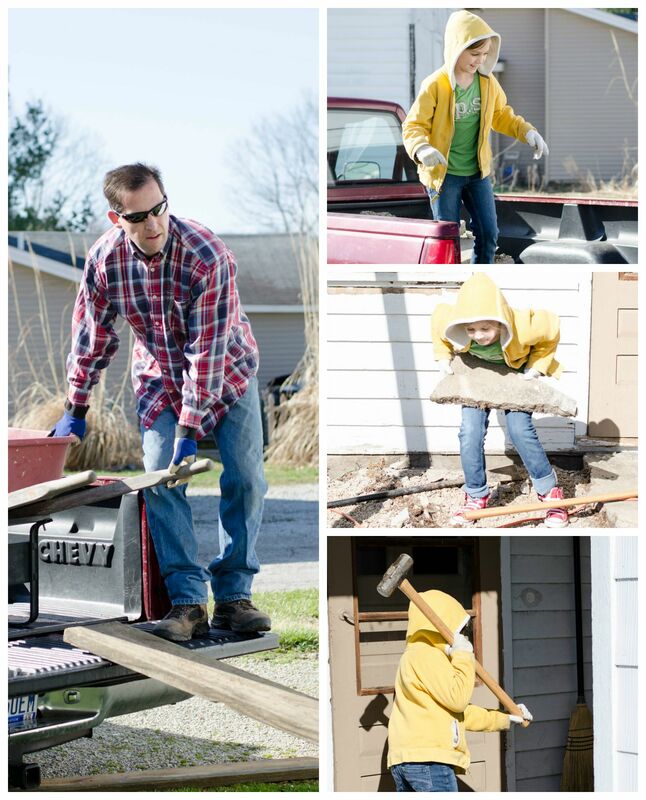 Today I get to share my Porch Remodel with you and introduce you to the Junk Visionaries! 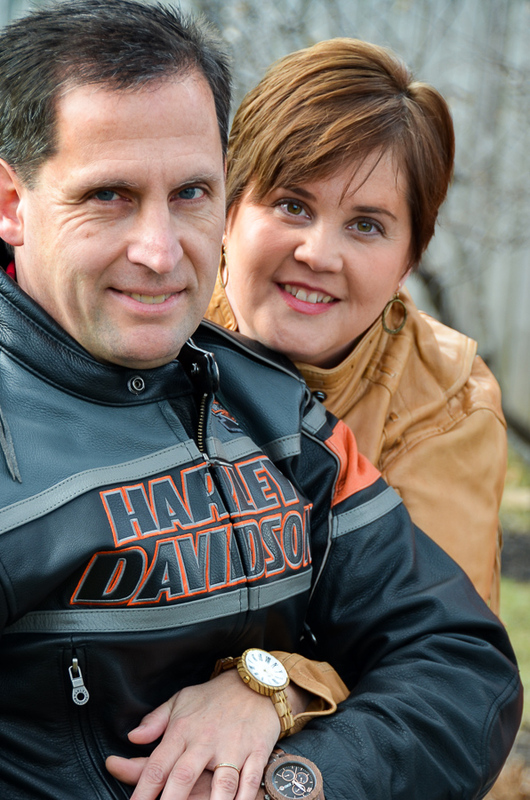 This group was started by my friend Lucy who blogs at Patina Paradise. It’s been fun working with her to pull this together. Our first category is Outdoor Projects. Now this is supposed to be about taking something junky and repurposing it or making it into something cool. 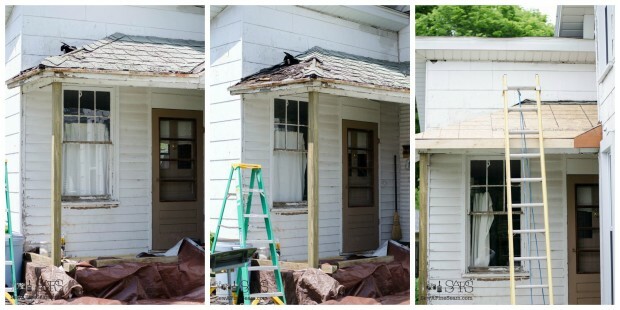 Hopefully mine isn’t too much of a cheat – a kitchen porch remodel isn’t exactly an old piece of junk, but let me tell you the before was pretty junky! It still could be considered a bit junky I suppose as it still needs paint and/or siding. But the sagging porch roof has been beefed up and replaced, the broken concrete has been removed to be replaced with treated wood and a really cool wrap around step. 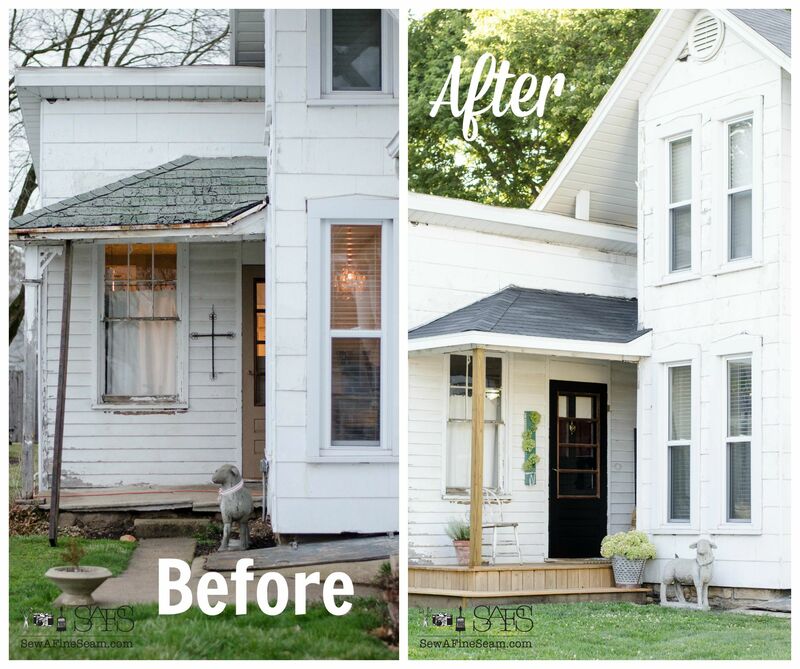 As you can see, this porch was in extreme need of a makeover. It was horrid! I really can’t believe we let it go as long as we did. Push came to shove after the concrete cracked completely in half this winter and the left side wasn’t stable any longer and would move when you stepped on it. Now it was a safety hazard as well as an eye sore! 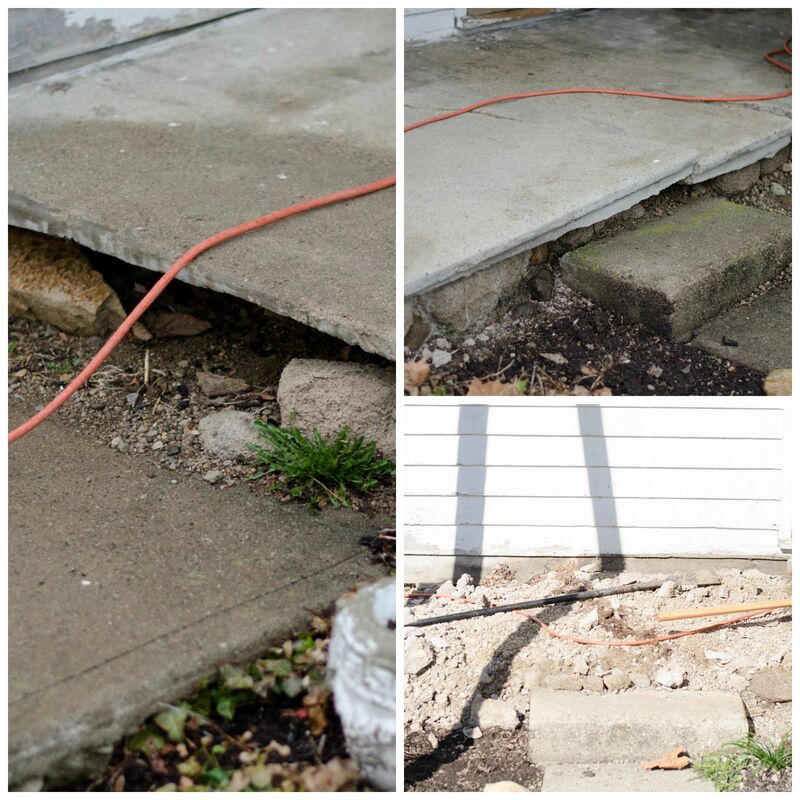 You can see how the gravel under the concrete had slowly eroded away over the years, allowing the concrete to rock when it finally cracked all across the middle of the porch. As soon as the weather permitted in the Spring my husband started in, tearing out the old concrete. You can also see here that to have power in his garage my husband had to string a lovely orange extension cord from the outside socket on the house to the detached garage. While this porch was torn out he added an electric line underground that eliminated the need for an extension cord and allows him to have lights and power in his garage at the flip of a switch. Hard work calls for a mid morning break – milk and bananas. Milk and bananas helps combat the sore muscles that come with hard work. After the old concrete was hauled away the new porch was framed up and the new post installed. The horrid, old shingles were torn off and the new roof installed. The porch is made of treated lumber and instead of just a single step like before, Travis suggested making a wraparound step out of the same lumber. I love how it turned out. It’s amazing to me the difference this made in how our house looks. Yes, it still needs new siding. Yes, it’s still a bit shabby looking with all the peeling paint. But that straight new porch instead of the old sagging one it looks much better and somehow makes the need for new siding fade into the background just a bit. I shared earlier how I painted the door and added the old time card holder to the porch. I tucked some of my hydrangea blooms in the holder for this photo shoot. The flowers I had in it earlier were drooping from humidity as were the sign cards I had added to it. And now you need to go see what my friends did for their projects! Thanks so much Cathy, yes there are always projects with an old house – at least we are never bored! LOl! Wow! What a transformation! Great job Jill. Your new front porch is spectacular! I have such a soft spot for old houses. I love everything about them and yours looks beautiful! The card catalog is a great addition to your porch! Thank you for sharing! Thanks Cat! I’m really really loving my new porch! I love the way he did the wood around the new porch, and that sheep greeting you is just precious. I am sure it makes your happier just walking up. Great Job. It makes me smile every time I see it Sandy! Wow what a difference… love the added wrap around addition…Looks great! Thanks Tammy, we all love it! Old houses do take a lot of upkeep, but the ‘character and charm’ is well worth the time and effort. Your porch update turned out great and the ‘wraparound step’ was a very smart idea. Enjoy your newly updated porch. Yes, they are worth it – once some of the modernization is done, like a/c, heat, plumbing, electric 😀 We have almost all that done – one bedroom still needs insulated well but other than that it’s pretty comfortable and ‘modern’. What a difference between the before and after photos! Your efforts really made a difference. 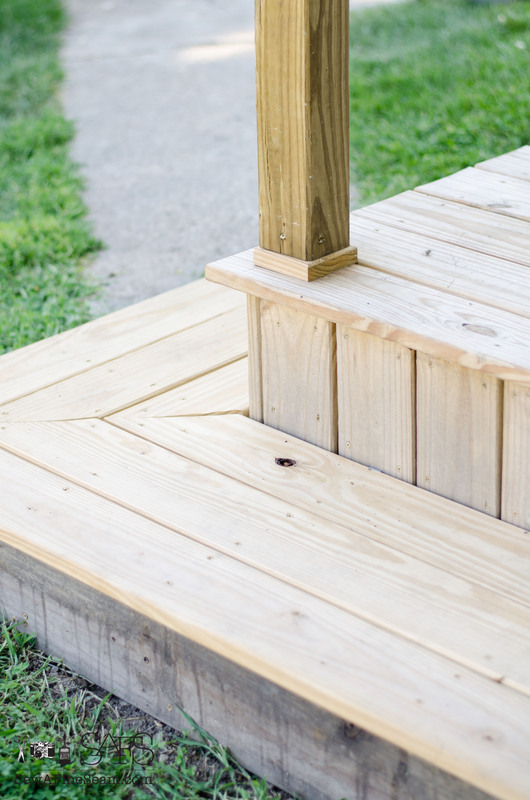 Your front porch truly looks fabulous with the new steps made from treated lumber and decorative touches. I also love your quote where you talk about old homes having lots of character and how it brings out the character in us. This is so true! Before and After photos of projects like these are so fun. This one really did change things so very much! Jill, the porch sets off the house and is lovely. The wrap around addition adds character and looks great. The added plants look nice. I have had three old houses, two were in the 20’s and the third is 41 yo, not really that old but everything is starting to need updates. 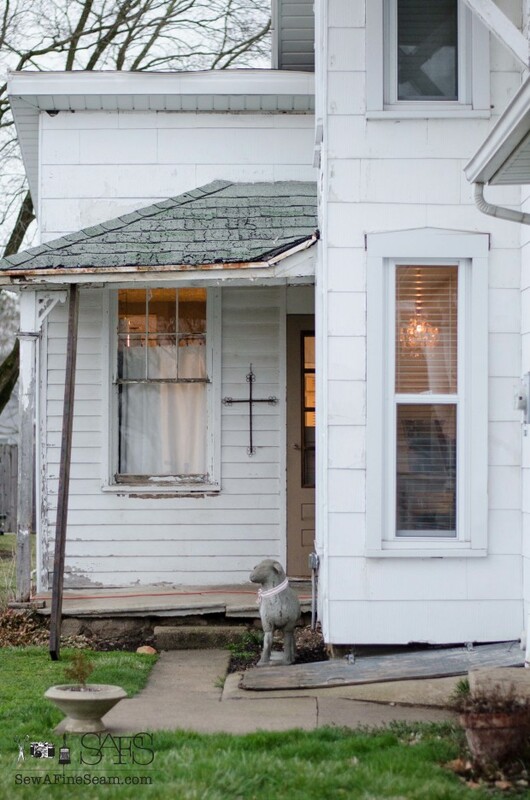 You are right about the older homes having character. I have had old and new homes. I prefer the way the old homes were built years ago, most of the homes built today have no character. Yes, the character is so nice in old homes – especially after they’ve been insulated good and had new heating/air and plumbing and electric added! All the modern updates with all the old charm too LOL! This is awesome, Jill! I love the wrap around stoop. I definitely know how hard it is to wait to update and repair when there are so many other priorities. Good for you! Isn’t that step awesome?! That was totally my hubby’s idea and I love it! Oh my goodness Jill, your porch really makes me pine for a house of our own. 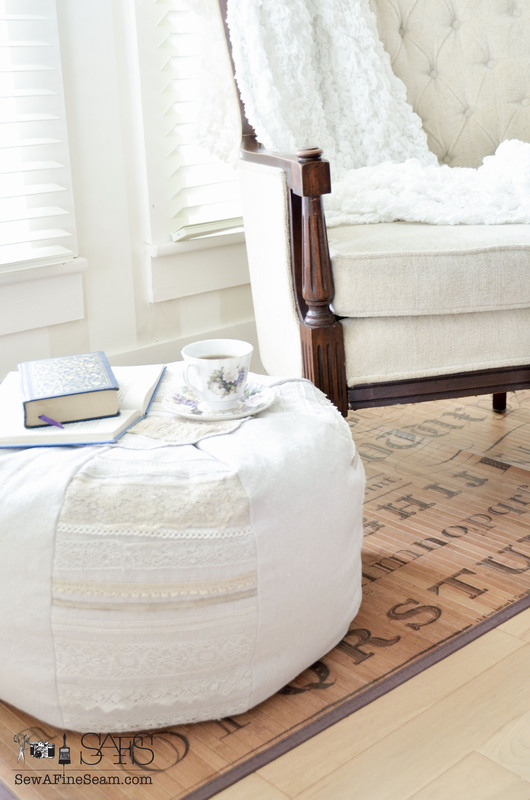 I love the wrap around step and the patchwork of all the different textures. They are poetry to my soul! So grateful to have you in Junk Visionaries! What a charming little porch. I love the wraparound steps. It gives it a fresh look and it’s practical as well. The cardholder with hydrangea is charming,too. I’ll be you’re relieved to have it safe again as well. I love using my hydrangea blooms for decor! And yes, it was nice to get the old, unsafe concrete pulled out and replaced with wood! 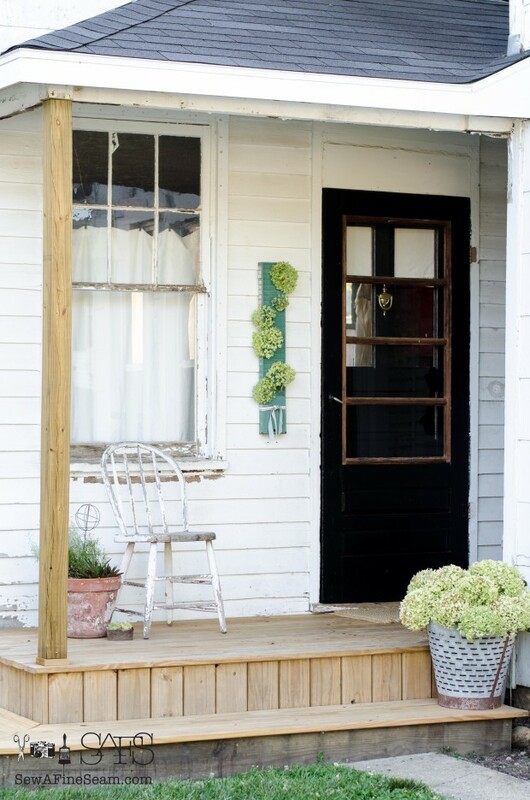 Your new porch is so pretty and I love your black door too!! I really like my black doors! I wasn’t sure at first if I’d love them but now that I have 2 of them painted instead of just the front door I really do love it! Wow Jill! What a difference! I love the wrap around step and your little lamb is cute too. I know what you mean about old houses and one project leading to another! Love your new porch … it looks great! I love my little lamb too! He was a Christmas gift several years ago. Wow, what a difference! The porch looks much better. You and your family should be proud…it turned out great! Thanks so much Kimberly! The sheep was bought from a friend who had a shop years ago. There is a store here in my little town that has had them before – they can be hard to get. Want me to ask about getting one for you? they are HEAVY – like 200 pounds heavy. Takes 2 men to move it! Love it! I drove past the other day but was too busy craning my neck to see what your front porch held that I didn’t look at your kitchen porch. It’s gorgeous! LOL! You should have stopped in! 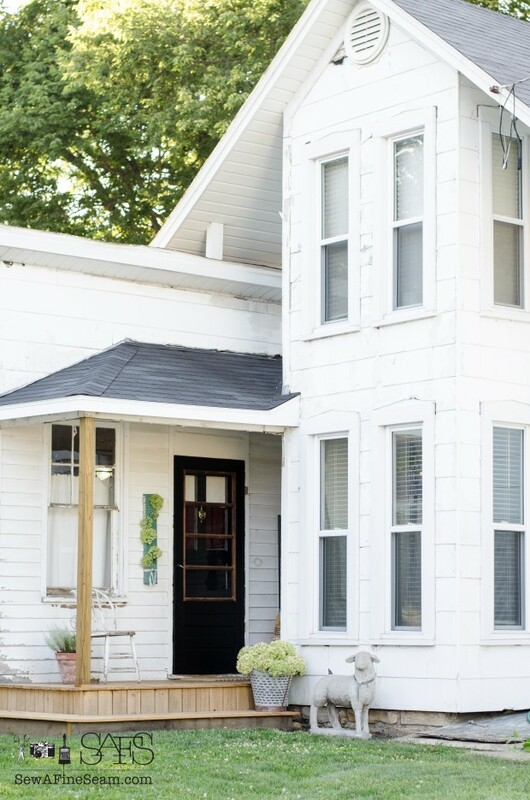 Someday my front porch will be beautiful too instead of filled with junk – heehee! It is awesome! Love it!! What a terrific job. I agree ~ It totally gives the house a new look. I’m crushing on the step, too. I can just feel the happy feel you have every time you pull in. And what a cute helper! I like how you put the collage type pictures in the post. Curious how you did that?! 🙂 Always up for new blogging tricks. I love that step too! We all love how this turned out. And that helper is the best – especially when snacks are involved! Bet you feel like you have a whole new house! if you know what I mean. A new entry makes every thing better!!! Wow….what a difference. Love the step and also the way you have decorated it. Nice job!! Thank you Jo – we love it and can’t get over the difference it made! 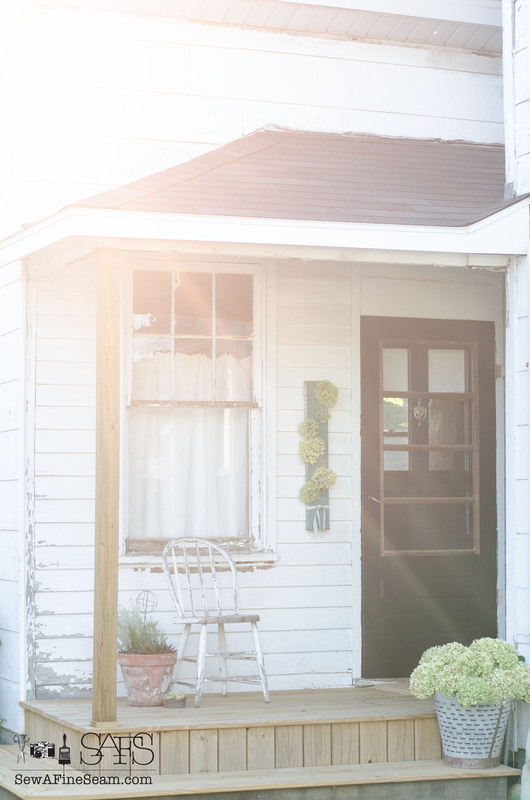 Love the outcome of your porch. I would varnish it a few coats to protect it from the weather. Sewing is my hobby since I was 12 years old, (now 68 years old) but only had boys and grandsons. I do not regret it, because I make pillows, curtains, one quilt, etc. It is a great therapy! Thank you Maria! We are planning to get a few coats of a good sealer on the wood before winter! Sewing is a wonderful activity for all ages isn’t it? !